First, let's take a moment to commemorate the tragedy that has just whipped Indonesia again back on its knees. The surge of news of the earthquake that hit the less-fortunate part of Yogyakarta was very devastating. These poor people have nothing left and they wish sincerely for our help. Please kindly spare a change to help them overcome this nightmare. Visit Indonesia Help for more information and links to donate. Now let's step aside and explore more of Indonesia cuisine. 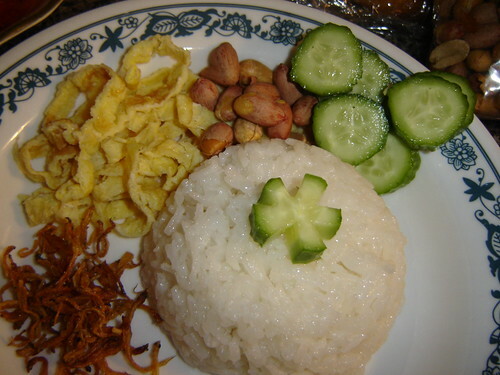 In this post, I'd like to present you with this traditional dish from Jakarta, Nasi Uduk Betawi. The name itself literally means Betawi Uduk Rice. "What is Betawi", you may ask. Well, I have a little introduction I'd like to share. This is only based on my elementary and junior high school history class and I didn't do any research [too lazy!]. Betawi is actually another name for Indonesia's capital city. During the Dutch occupation this place was called "Batavia" while the native Indonesian called it Sunda Kelapa. It was one of the important harbours where merchants underwent trading with the Europeans. Indonesia was renowned as a source of spices and it became a very valuable commodity. That was one of the reasons why the Dutch occupied Indonesia in the first place. In the fight for independence, Indonesian troops leader decided to declare Sunda Kelapa as the capital city of Indonesia, changed the name into Jayakarta and then announce the letter of independence there. Not long after, the name was shortened into Jakarta. However, this highly dense city is still known as Betawi, especially by the suburban [read: village] people. They have their own unique culture and are proud of it. One of the tradition they're proud of is this Nasi Uduk! It's normally served with Indonesian fried chicken and spicy peanut sauce. One outstanding, yet often ignorable, ingredient in this recipe is coconut milk. As you all in Canada know, we can conveniently purchase a can coconut milk sold at the grocery stores. What you'll get from the can is the thick creamy liquid oozing with distinctive fragrance. However, the authentic coconut milk is not the same. I must say, it's irreplaceable by the canned version. I'm not saying that canned coconut milk is bad, it's just too concentrated and it takes away the subtleness that it should be offering. Thus, I'm going to use this opportunity to give a tutorial in making FRESH coconut milk. Are you guys with me so far? For some of you, this might be a custom already. It is a usual thing back home. We would get fresh old coconut [not the young one! ], already halved, from the market in the morning. Then make coconut milk with freshly grated coconut. There are two kinds of coconut milk. The light one and the thick one. Most of Indonesian dishes are happy with the light one, which contains more water. To make the thick one, you'd have to let the light coconut milk stand for a few minutes, the coconut cream would separate from the water. Then, scoop up the creamy part. That's you thick coconut milk! Now, I'm just going to show you to make the light one. I was lucky enough to have finally found this coconut [imported from Costa Rica] at Price Chopper. I've never seen them anywhere else. First, you will need a hammer to crack open this whole coconut. From my experience, I used a large knife and all of my energy to break it in halves. It was very exhausting and itme-consuming! So, I recommend you to use a hammer. After you've cracked it in halves, try to halve them again. So You'll end up with quarters of coconut [just like the one you see at the top of this entry]. The reason why you might need to do this is that this process makes it easier to get the tough shell off. Afterward, you can easily peel off the inner skin with a knife. You're ready to dessicate the coconut now! Have a grater ready, and position your coconut quarter [one at a time!] 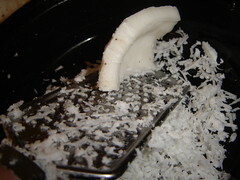 like the picture below so that you'll get longer strands of grated coconut. Do not do it any other way or you won't be able to extract the milk out of the coconut. 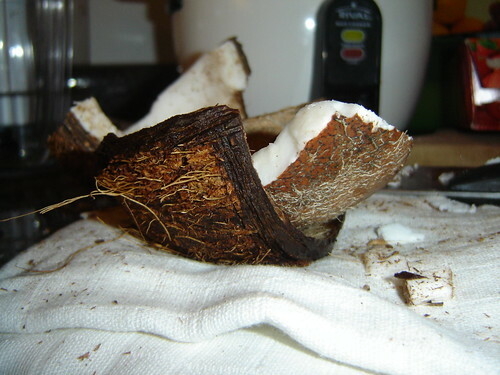 After you get all of your coconut grated, put it in a bowl then pour 500ml of warm water into it. Let it stand for 5 minutes. Stir it with your hand once in a while. Get a sieve ready over another bowl. Grab a handful of grated coconut that has absorbed the water and start squeezing the liquid out. Continue until you finish the rest of the coconut. That's it my friend. Simple and easy, huh? [not including the part where I had to crack open the coconut] And you'll get the fresh coconut milk canned version could not offer! 01. Cook the coconut milk along with salt, bay leaves, lime leaves, and lemongrass in a medium-sized pot. Bring it to boil, then simmer immediately. 02. Stir in the half-cooked rice into this mixture. Stir with wooden spoon until the coconut milk is absorbed by the rice. Remove the bay & kaffir lime leaves and lemongrass. 03. Continue to steam until the rice is fully cooked. Note: If you think the coconut milk is too much or too little, please adjust it yourself. I was cooking by proxy at that time. First of all, I'd like to congratulate Mae for moving to this very sophisticated-looking and more personalized food blog. It's so lovely and you should check it out! Since I couldn't find rib eye steak in the grocery store, I used the T-bone steak instead. At first, I had no idea which beef I should use in place of rib eye. However, this T-bone steak was the most expensive per gram, so I landed my choice on it. 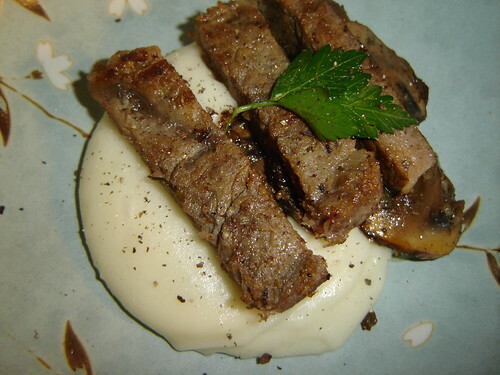 I don't eat beef that often anyway. So, a special treat once in a while is alright :) Right? In addition to the spices that Mae used, I added crushed fennel seeds and some sliced mushrooms. I marinated the beef for a night before pan-frying it. As a side, I of course opt for mashed potatoes as suggested by Mae. However, I had a craving for Popeye's smooth mashed potatoes. It's actually not mashed, rather it's pureed. So, having owned a blender, I pureed my potatoes in it. First, peel the potatoes (around 2-3 of them), cut into quarters, then boil for almost an hour. Put the boiled potatoes into the blender. Meanwhile, heat a tablespoon of butter and 1/4 cup of milk in the microwave. 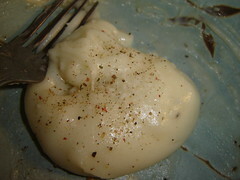 Puree the potatoes with the butter and milk mixture to make them smooth. This was such a gourmet meal! Thank you Mae! Next, thank you for Jasmine at Cardamom Addict for the offer on the cats advice. I really truly appreciate it. 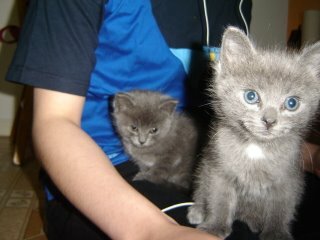 I am a first time cargiver for kittens. So, I really don't know what I'm doing. And thank you for the prompt reply of your e-mail. Don't worry, I still have more questions to ask, just too busy right now. And finally, thank you so much from the bottom of my heart to Rob and Rachel from Hungry in Hogtown. Thank you for the CBBP package you both have thoughtfully and carefully arranged for me! 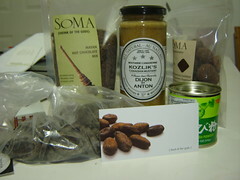 I could really feel the chocolate and spices theme, especially after I tried on a sip of the Mayan hot chocolate. The mustard was also wonderful, I often pass by Kozliks at St. Lawrence Market but too hesitant to give them a try. I really like the chocolate covered hazelnuts and have finished half of them already [oops, only 5 pieces left now]! Last but not least, thanks for sharing the recipe and providing me with the ingredients! My deepest gratitude to both of you. Before I forgot, I'd like to thank my professor whom I'm volunteering with. Although this is weird and he could not possibly be reading this. But, still, thank you for letting me not come to work this week! The beginning of summer school was just overwhelming! In spite of my busy-ness with the adorable yet frustrating kittens and summer school, I feel a bit relieved now that I can thank many people who made my day and even my week. Thank you for everything! In the Mood for Pink ! There are too many to be celebrated as the spring lazily crawls in to the city of Toronto. I feel like the fresh air of change the spring brings is a bit overwhelming. From the beds of white snow to the beds of lush green dotted everywhere with dandelions. From the head-to-toe wrapped walking people to the glowing skins proudly shown off by those same people. And most of all, the shift of our moods... in foods, colours, themes, spirits, and much more! Lately I've been in the mood for the color pink :) The "me" who usually undermine pink as too girly and mushy, suddenly fall for this cheerful, heartwarming color. I haven't completely altered my favorite color from blue to pink though. The pink that I love the most are the ones that adorn the budding spring trees, in the park, in the woods, along the streets. Have you any idea what I'm talking about? Crabapple trees and cherry blossoms to mention a couple. After doing some research, I found out that there are quite a variety of crabapple trees, bearing fruits that range from green to red. 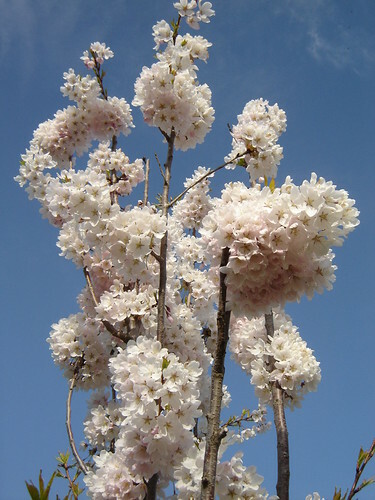 As I've mentioned before, the flowers of these trees very much attracts lovely spring birds and insects such as hummingbird and honeybees. 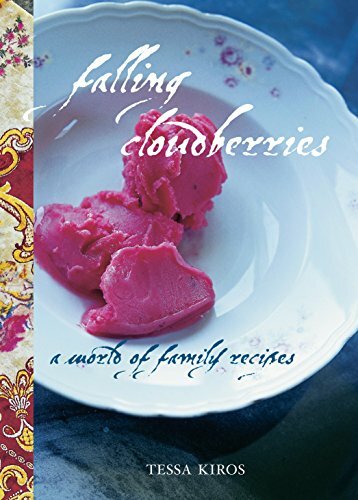 In fact, the red fruits that resemble currants are really high in pectin and very much suitable for making jelly and jam. In this very same underrepresented part of GTA called Scarborough, there lies a healthy bunch of first-bloomed cherry blossoms. 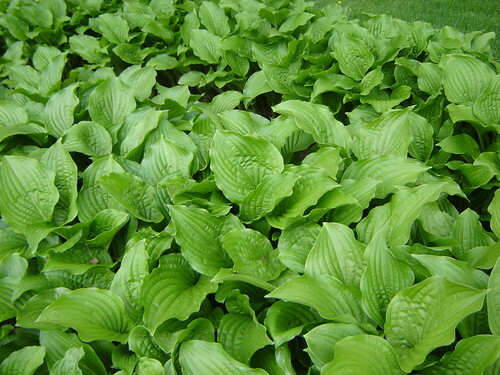 They are planted right in front of the Management Wing in U of T Scarborough Campus as a goodwill between Canadian and Japanese ambassadors. Their flowers are really pretty and this is the first time I've even seen cherry blossoms live! To pair up this mood for pink, of course I tried creating a food filled with the spirits of pink. This carrot cupcake with pink and yellow icing is what I came up with. Well, you be the judge whether they compliment the spring. This recipe can be found at Joy of Baking. However, I halved the recipe to serve the lesser crowd. Also, since I ran out of red food coloring, I decided to color the cream cheese frosting with strawberry jam. Although it did not really bring out the vibrant pink that I wanted, the icing spreads beautifully and still harden after cooling.